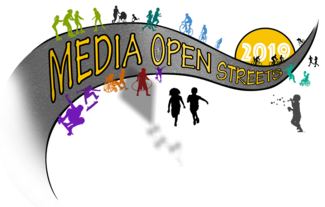 Hello, and thanks for your interest in the second annual Media Open Streets Day! Media Borough is planning an Open Streets event for Sat, Sept 28th from 10am to 3pm (rain date TBD). Our Open Streets event is similar to other events around town where streets are closed to car and bus or trolley traffic, but different in its purpose, which is just to get people of all ages out in their streets, to experience the town in a different way - on anything people-powered, not motorized. Roughly 3/4 mile of neighborhood streets, from 5th and Jackson to Glen Providence Park, will be free to traverse by foot, roller skate, bike, wheelchair, or anything else people powered. The street closure (to traffic) and opening (to everything else!) will be complemented by safety, health, and entertainment programming along the route and in Glen Providence Park, so that hundreds of borough residents and visitors can ‘make a day of’ enjoying car-free Media Borough. But we need help to pull this off! There are several volunteer roles that need to be filled: crossing guards/safety marshals at intersections, helpers for activities, and general greeters. We ask that you be aware of the time commitment required as a volunteer. Reporting time: All volunteers MUST report to the volunteer station next to Borough Hall at least 25 minutes before their scheduled shift. Parking: There will be several road closures for the event. You are encouraged to walk, ride your bike, or use public transportation. If you need to drive, parking is available at the Borough Hall/Community Center lots, accessible from 4th Street (enter 4th from Monroe, since Jackson will be closed). What to bring: Sunscreen, a hat, sunglasses, and comfortable shoes. Water will be provided but feel free to bring a water bottle. What we provide: Water, snacks, a Media Open Streets 2019 volunteer t-shirt, and a chance to be part of a great new event in our town! Need 1 at most intersections, and 2 at some-Marshals will in some ways be the face of our event. T-shirts to keep, reflective vests to wear, and responsible to:direct traffic at Lemon and 3rd, help with event safety (call 911 if issues), & direct traffic.